The concept is simple, a bloody mary with tequila instead of vodka. 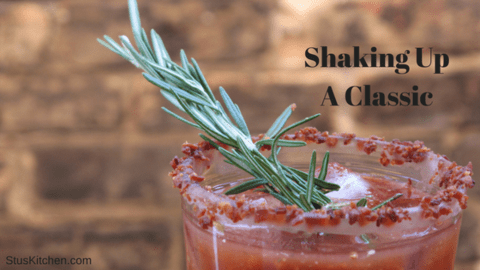 This is a delicious twist on the Classic Bloody Mary. But with this recipe, swap out the vodka with some tequila. We love it because Tequila offers bolder flavors that pair perfectly with the spiciness and smokiness of our mix. If you’re familiar with Stu’s Bloody Mary Mix, you know that making any bloody is crazy simple. It’s the 2-6-1 formula. Where you normally used 1 oz of vodka you are now using 1 oz of tequila. That’s how easy Stu’s makes it for you. No muss, no fuss–just a damn delicious Bloody Mary. What’s in Stu’s Bloody Mary mix, and why is it the best? You certainly can’t go wrong using the Stu’s Original Flavor, but we do recommend our Smoked Jalapeno Bloody Mary Mix for your bloody maria recipe. The smokiness of this mix really accents the Tequilla well. Where the bloody maria came from is just as ambiguous as the origins of the bloody mary itself. What we do know, however, is that the designation of who invented the bloody mary is hotly contested. All that being said, many credit Fernand Petiot with inventing the bloody mary all the way back in 1921. This claim is held most true probably because it is the earliest account by at least ten years. With so many variations of the bloody mary (ones made with bourbon, rye, gin, etc.) the origin of the bloody maria, a tequila variation, is highly nonspecific. Adventure is the spice of life. Don’t settle for the typical, tired old bloody mary. Try something new. Next time you are feeling like taking a chance, or you just want to break the monotony, give this latin inspired bloody a try. You may just find the bloody maria is your new go-to beverage for taco Tuesday with the buds.